Sharing household chores is an important part of marriage for a majority of married adults. But among those who have children, there are notable differences in perceptions of who actually does more of the work around the house. More than half of married U.S. adults (56%) – both with and without children – say sharing household chores is “very important” to a successful marriage, according to the most recent report from Pew Research Center’s Religious Landscape Study. That ranks behind having shared interests (64%) and a satisfying sexual relationship (61%), but ahead of having children (43%) and having adequate income (42%). Among married adults, men are slightly more likely than women to say sharing household chores is very important to a successful marriage (63% vs. 58%). And those ages 18 to 29 (67%) and ages 30 to 49 (63%) are more likely to say sharing chores is very important, compared with 57% of those ages 50 to 64 and 56% of those 65 and older. According to a separate Pew Research Center survey of American parents conducted in 2015, half of married or cohabiting couples living with at least one child under age 18 say their household chores are split about equally. But 41% say the mother does more, while 8% say the father does more. The workload is seen as somewhat more equitable in households where both parents work full time: 59% of adults in this type of household say chores are divided about equally, while 31% say the mother does more and 9% say the father does more. To be sure, even among couples where both partners work full time, the number of hours worked may differ significantly, and this could in turn influence how household chores are distributed. Previous research indicates that, among full-time working parents, fathers work more hours, on average, than mothers do. And indeed, personal earnings, which are linked to hours worked outside the home, are associated with how U.S. parents perceive the way their household chores are split. Those who earn about the same as their partner are more likely to say the division of household labor is about equal (65%) than those who earn less (52%) or more (51%). Among those parents who earn less than their partner, 41% say they personally take on more chores than their partner, while just 6% say their partner does more around the house. And among those who earn more than their partner, 29% say their partner does the larger share of chores, compared with 20% who say they personally do more. Perceptions about how chores are delegated differ significantly by gender. Fathers are more likely than mothers to say the chores are split about evenly between both partners in their household (56% vs. 46%). Fully half of mothers (50%) say they take up more responsibilities around the house than their partner, compared with just 12% of fathers who say they do more around the house. 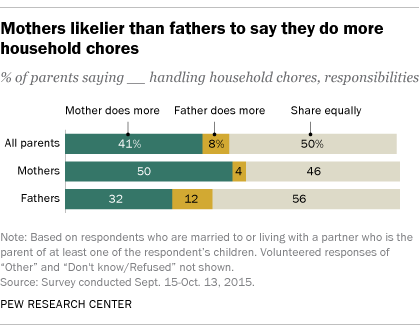 About one-third of fathers (32%) say their spouse or partner takes on more of the responsibility for chores in their household, compared with just 4% of mothers who say the father does more.